After an incredibly indulgent couple of weeks with back to back holiday celebrations, festive outings and everything that comes along with it, we were antsy to make a winter salad that would feel comforting but light. No small feat when it's chilly and all you want to do is curl up with a bowl of pasta. We partnered with Goat Cheeses of France to dive deep into the vast world of goat cheese for this dish, and it wasn't difficult to find meal inspiration once we nailed down the star of the meal, a popular French favorite, the very creamy and flavorful goat cheese Chèvre D’or. So-called "fancy" cheese is something we usually save for gatherings with friends or when I'm putting together an elaborate cheese board, but we wanted to showcase how to use something that's usually reserved for a special occasion into a simple but elevated everyday meal. Literally translated to "Golden Goat Cheese" it is small, but mighty in its flavor profile. 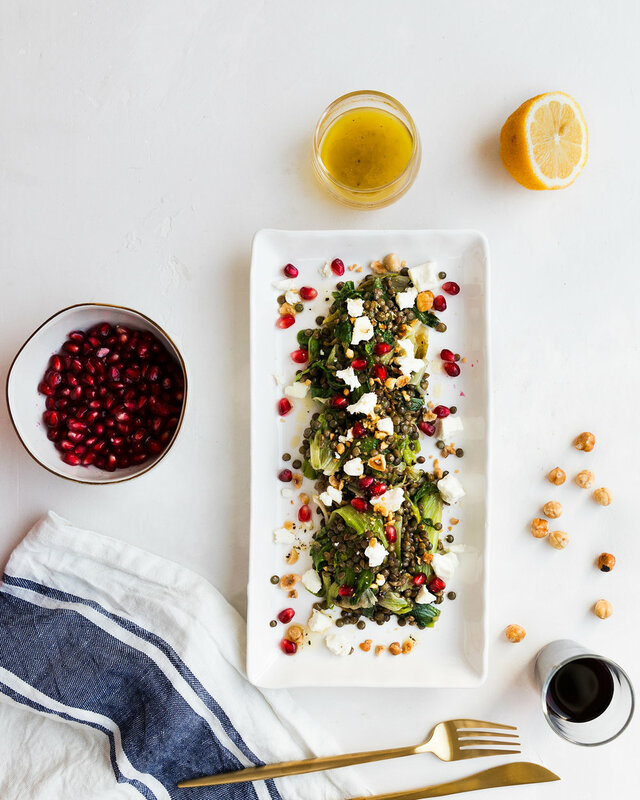 The creaminess was balanced by a nutty and earthy flavor that was perfect when we paired it with french lentils, pomegranate seeds and escarole. Creating a salad like this looks much more complex than it is, with the longest time commitment being the cooking of the lentils. Perfect for a night in when you're trying to up your greens between holiday gatherings, without sacrificing the need for comfort food.